The publication of Gathering Time marks a turning point in our understanding of the early Neolithic, and a revolution in dating methodology. New radiocarbon techniques have resulted in a more precise chronology for causewayed enclosures in southern Britain and Ireland than was ever thought possible. Christopher Catling summarises 1,000 pages of data to explain why this is a defining moment for archaeology. It is now 62 years since the technique of radiocarbon dating was developed by Willard Libby and his colleagues at the University of Chicago. As a by-product of research on the atom bomb and atomic energy, it was discovered that the carbon 14 isotope absorbed by all living organisms decays after death at a fixed rate; the amount of carbon 14 in ancient wood, bone, charcoal, grains, and leaves can thus be used to calculate the age of the material, and hence date the layer in which it is found. That, in very simple terms, sparked an archaeological revolution that enabled the relative chronologies prehistorians had to work with until the 1950s to be replaced with firm dates, based on hard science. Carbon 14 dates remain frustratingly imprecise, with results expressed in terms of a span of dates that can be several centuries wide. The tools to bring this ‘fuzzy chronology’ into sharp focus have been with us for some time, waiting to be rediscovered. Statisticians began working with ideas first expressed by the English mathematician and Presbyterian minister Thomas Bayes (1702-1761) in the mid-18th century. Bayes sought ways to calculate probability by concentrating on the most likely result from a set of all possible outcomes. He realised that the information from one outcome gave you new data that could be used to inform your judgement about the next. In archaeology, a number of mainly UK-based researchers who had been wrestling with the imprecision of carbon dating realised in the 1990s that new techniques based on Bayes’ research could be used to model more exact dates for Prehistoric monuments. Bayesian modelling involved refining what Colin Renfrew once described (in Before Civilisation, 1973) as the ‘good objective chronology’ of carbon dating through the use of additional contextual information — for example, the knowledge that ‘stratigraphically, this dated sample has to be earlier than this one’ or that the dateable artefacts found in the same context can be used to refine the carbon-date span. 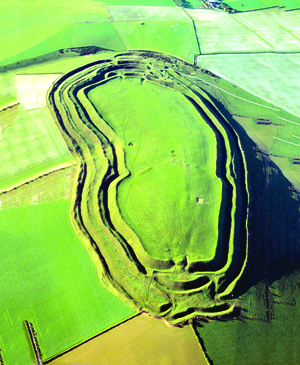 The application of Bayesian modelling to the carbon dates obtained at Hambledon Hill, for example, the Neolithic monument complex excavated by Roger Mercer in the 1970s and 1980s, has narrowed the construction date to a 45-year span, 3685-3640 BC, suggesting that the site was in use in its initial phase for between 310 and 370 years. The newly published two-volume monograph Gathering Time builds on the work of the scores of archaeologists who have excavated causewayed enclosures in the recent past. The book consists largely of tables and explanatory narrative showing how some 871 radiocarbon dates from 40 causewayed enclosures have been modelled using complementary site information in order to answer some fundamental questions: when were causewayed enclosures built in Britain and Ireland; are they all contemporary; over what period of time did they spread, and from where to where; how quickly were they built; was their use continuous or episodic; were they all used for the same length of time; did their use change over time? Crucially the authors also ask what the dating of causewayed enclosures tells us about the development of the British and Irish Neolithic. In all, an impressive 2,350 carbon dates were refined. The authors set out first to give dates for the elements of innovation that define the early Neolithic: domesticated animals and cultivated cereals, bowl pottery, leaf arrowheads, ground axeheads, rectangular timber buildings, flint mines, and monument construction. They argue that there is no precedent for any of these in the late Mesolithic of Britain and Ireland, and that they first appear in the archaeological record in the Greater Thames estuary in the 41st century; neolithisation then spreads gradually and from multiple foci further into southern and eastern England, then westwards to reach Wales and the Marches by 3700 BC. Long barrows and long cairns are the earliest form of Neolithic monument type, being built from around 3800 BC. (By contrast, there is no support for the idea that portal dolmens, small oval barrows, and rotundae are early.) The first causewayed enclosures are built a century or so later, most of them constructed in a major spurt of monument building that lasts for three or four generations from the late 38th century BC into the later 37th century. The first causewayed enclosures were built around the Thames estuary, though early examples are also found in Sussex and eastern England, and in the south-west peninsula. Within perhaps no more than two generations, the idea of enclosure then spread to Wessex, and thence, within two further generations, to the Cotswolds and the upper and middle Thames valley; within three to four further generations, by the end of the 37th century, enclosures are found in south-west Wales and the Marches. This is followed by a lull at the turn of the 36th century, before fresh building resumes in the mid- to late 36th century BC. Some of these sites were in primary use (as distinct from later re-use) for up to 300 years, but many others were used for a much shorter period — in some cases, just a few decades — and the enclosures with the shortest life are those that belong to the later stages of this monument-building tradition. In Ireland, there are hints at an even earlier date for an attempt to introduce Neolithic practices: the dating of domesticated cattle bones at Ferriter’s Cove, County Kerry, to the later fifth millennium has led Alison Sheridan (in Antiquity and elsewhere) to suggest that Neolithic migrants tried unsuccessfully to establish a foothold in Ireland before the later and more successful cross-Channel migrations into England. Puzzlingly, an Irish causewayed enclosure at Magheraboy, County Sligo, is also very early, being dated to the 40th or 39th centuries BC, opening up what the authors call a ‘challenging gap’ between this early date (earlier than English examples) and the fact that Neolithic practices in Ireland do not get under way until the late 39th or early 38th centuries. This is an extract. The full article can be found in Issue 259 of Current Archaeology. Previous CA259 Next Peckish for Picts?